Bermuda and Mexico are similar in some ways, different in others. One thing I find to be true about both of them is that they are HOT! One thing I love about them is the birds! "Banyan and Cockerel" Oil 5"x 7"
I spent a large amount of my time in Bermuda working on "Banyan and Cockerel". I find trees beautiful and endlessly fascinating, especially the trunks! The feral rooster in the painting really "makes" this picture. This tree is one of the most popular in Bermuda's Botanic Gardens, for good reason. "No Entry" Oil 5"x 7"
The scene in "No Entry" is in the city of Saint George's. Most of the roofs in Bermuda are designed to slow the drainage of rain from their surface for the purpose of collecting the water in underground cisterns. During droughts, the Bermudans sometimes have to import their water. Most food is imported year round. 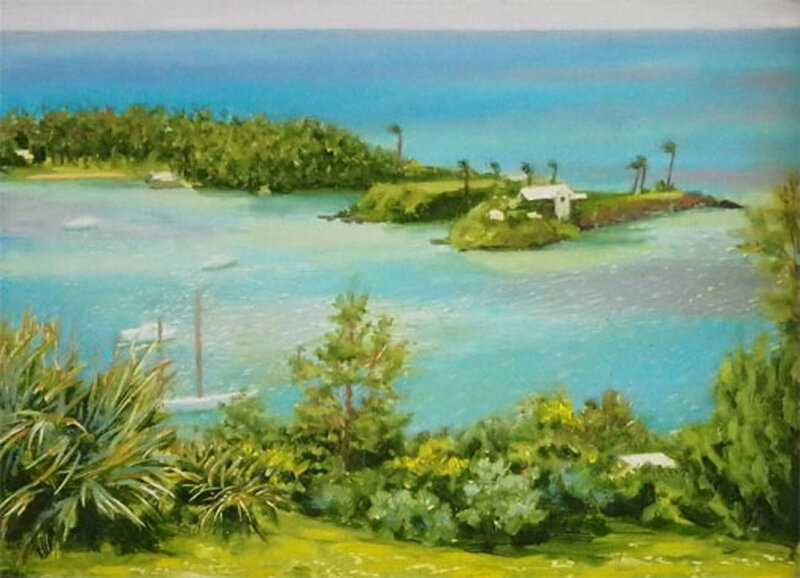 "View from Castle Point" Oil 5"x 7"
"Castle Point" is in a very exclusive spot that you have to get special permission to visit, as this is in a section of Bermuda reserved for the estates of the extremely wealthy. The longer foliage in this painting shows that the wind is blowing. "View from the Scaur" Oil 5"x 7"
I have no idea how this high point came to be known as The Scaur but it is. Remnants of Fort Scaur, which was built by the British in the mid-19th century, still stand atop the Scaur in what is now a public park. "Garden Tree" Oil 5"x 7"
I no longer remember what kind of tree this is in "Garden Tree" and it was more interesting to me in life than this picture suggests. The cloudy day made the light relatively uninteresting. I think what this picture is missing is a chicken. Should I add one peeking out from the tall grasses? "The Littlest Lizard" Oil 10 3/4" x 8 1/4 "
"The Littlest Lizard" is a view of the open-air courtyard in an old colonial home in Mérida. This highly realistic and detailed painting took hours upon hours to complete. As I recall, the baby lizard is an iguana, a very common lizard in Mexico. 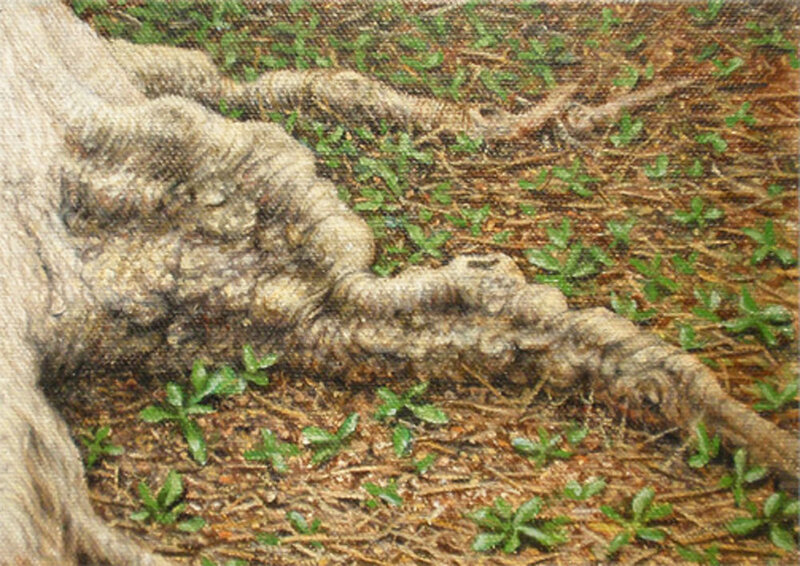 "Laurel Tree" Oil 5"x 7"
I adored painting the white-painted trunk of the "Laurel Tree". This tree was on Paseo de Montejo in Mérida, Yucatán, not far from Monumento A Los Montejo. I love painting a tree that seems to be in motion. In fact, trees are moving, growing and twisting towards the light and in response to nearby trees. "Danzon" was named for the Cuban dance I became acquainted with when I visited the city of Mérida in the Yucatán. This tree seems to be dancing with the window in front of it, and I love the shadows cast by the tree's leaves that splash across the wall of the Catholic church, Parroquia Santa Ana, in Parque de Santa Ana. "Conversation Bench, Santa Lucia Park" Oil 5"x 7"
Santa Lucia Park, in Mérida, Yucatan, with it's "Conversation Bench" is dotted all around the edges with large shade trees and conversation or "kissing" benches. The lower part of of the tree trunk is painted white to keep ants off. "Beach at CeSiak, Quintana Roo" Watercolor 5" x 7"
"Beach at CeSiak" shows a view of part of a nature preserve that is now, perhaps unfortunately, closed to the public. Sea turtles hatch on the beaches here and a nearby lagoon is home to many kinds of wildlife, including tropical birds. "Roots by Lamplight" Oil 5"x 7"
"Roots by Lamplight" was executed after dark. The only light source here in Parque de Santa Ana was a street lamp. The quality of the light was not very interesting, but I still could capture the textures of plants and debris on the ground.